The New Oxford Shakespeare authorship team argues that Christopher Marlowe had a hand in all three Henry VI plays, and that Shakespeare wrote parts of Arden of Faversham. However, the quantitative methodologies employed to reach these conclusions are dubious. This article suggests that reading-based methods still have a place in modern attribution studies, and that authorship tests proven to be reliable by generations of scholars undermine many of the ascriptions expounded by Gary Taylor and his colleagues. 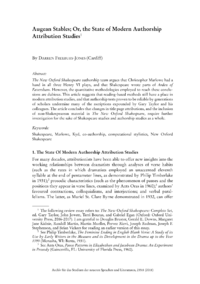 The article concludes that changes in title page attributions, and the inclusion of non-Shakespearean material in The New Oxford Shakespeare, require further investigation for the sake of Shakespeare studies and authorship studies as a whole.